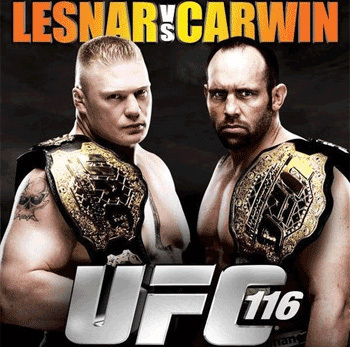 The biggest fight in MMA history will finally go down when heavyweight champion Brock Lesnar looks to unify the title against interim champ Shane Carwin at “UFC 116: Lesnar vs. Carwin.” The organization has just released the official poster for the July 3rd event, as tickets go on sale this week. UFC Fight Club members will have the opportunity to purchase tickets to the show tomorrow, May 11th at 10AM PDT at Ticketmaster.com. A special Internet ticket pre-sale will be available to UFC Newsletter subscribers Wednesday, May 12th starting at 10AM PDT.